Peloton Founder and CEO Josh Switkes shifted the platooning conversation toward potential safety benefits during a presentation at the Automated Vehicle Symposium in San Francisco, California. 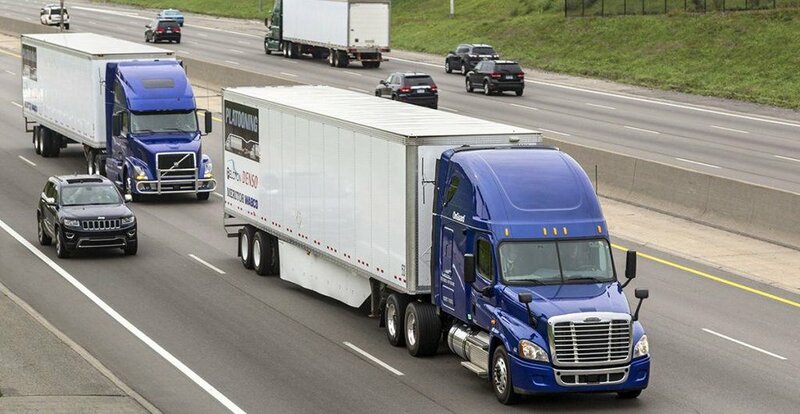 Platooning involves grouping multiple trucks together, often using vehicle-to-vehicle and vehicle-to-cloud communication to reduce following distance and automate braking. While platooning enthusiasts often talk about the possibility of fuel savings, the practice’s impact on safety has been highlighted by industry leaders multiple times in recent months. That means being safer than new trucks equipped with collision management systems and automatic emergency braking technology, according to Switkes. Achieving this goal requires Peloton to deploy safe hardware and software, ensure proper functionality and make sure driver attention is not compromised. Managing these variables successfully leads a platooning environment where common concerns, like front truck hard braking and collisions, can be overcome, according to Switkes. Platooning technology can shrink the safe following distance between trucks from over 500 feet to as low as 30 feet. As safe following distance decreases, so does collision risk and average impact velocity, according to Switkes’ presentation. The presentation showed the safe following distance between two “normal” trucks on the road to be over 500 feet, allowing room for the driver to perceive what is happening in front of them and then react, the truck’s brake lag and braking differences between vehicles. This distance also includes a driver attention buffer. One of the main issues with needing a 500-foot buffer is that drivers do not leave that much room in the real world, according to Switkes. Newer trucks equipped with radar and lidar technology can follow at a closer distance, with about 300 feet needed to ensure a safe driving environment. This is because the driver attention buffer is eliminated and perception and reaction times are decreased, according to the presentation. This following distance is more likely to be maintained than a 500-foot following distance, but cut-in vehicles still often reduce the distance to about 200 feet or less, according to Switkes. He said radar and lidar-equipped trucks result in a lower but still significant number of collisions. Impact velocity is often reduced, however. Platooning technology allows safe following distance to drop to a mere 30 to 50 feet, eliminating or significantly shrinking all factors. This following distance reduces cut-ins and allows platooning mode to be maintained most of the time, according to the presentation. One of the most common arguments against platooning is that it has a negative impact on driver attention, rendering them useless in the event that something happens and they need to take over control of the vehicle’s functions. Switkes said that, in his experience, this is far from the case. He attributed much of this to the fact that drivers are still required to steer the vehicle when platooning. The presentation broke driver stimuli down into four components when in platooning mode: standard driving tasks, platoon control, lead truck video feed and driver communication. Standard driving tasks involve things like steering and general awareness. Platoon control involves initiating platooning, dissolving platooning and monitoring platooning status. Lead truck video feed refers to a feed drivers have to monitor what is happening from the lead trucks perspective. The video feed is not something the driver should be fixated on, but more like an additional mirror, according to Switkes. “The driver should be scanning from time-to-time to understand what’s coming up on the road,” he said. Driver communication refers to conversations between drivers in the platoon. Drivers can speak to each other about traffic changes and road condition by pressing a button on the floorboard with their left foot, according to Switkes. Initial simulator results from the formal study indicate steady attention factors such as heart rate, reaction time and eye gaze, according to Switkes. On-road studies are also being conducted, but results from those were not shared.